Munich was founded in 1158 by Henry the Lion, Duke of Saxony and Bavaria. For many years it was a focal point in the salt trade. Salt was considered “white gold” in many parts of Germany in much the same way cotton was once the “white gold” of the southern U.S. In the 19th century Bavaria became the epicenter of the Germanic arts scene. After World War I the city experienced considerable political unrest. National Socialism (Nazism) was founded there and in 1923 Adolf Hitler failed in his attempted coup of the Bavarian government. Despite this failure, Hitler made Munich the headquarters of the Nazi party and by 1933 he was Chancellor of Germany. Munich was badly damaged during World War II, but after 1945 it was extensively rebuilt and many modern buildings were constructed. We arrived in Munich last evening and this morning took a guided tour of the city. Our tour guide had a thick German accent and was not as fluent in English as previous guides. None the less, the tour and our time here has left the impression that Munich is one of the more interesting cities we have visited. The tour began in the town center, Marianplatz. There we observed the grandest building in the city. It was explained that the building was built in two stages and, due to a mathematical calculation, the two buildings don’t align. Next our tour took us through the food market. The Munich food market is the largest outdoor food market in Germany. There are 140 vendors and it covers 240,000 square feet. Beer sales at market shoppes and restaurants are restricted to the six brands brewed in Munich. Following the food market was a visit to Saint Peter’s Catholic church. The church was originally consecrated in the late 12th century. Fire destroyed the church in 1327 and during WWII it was severely damaged by allied bombs. Both times the church was rebuilt. The clock tower at St Peter’s is the highest structure in Munich. The Church of the Holy Spirit was the 2nd church we visited. It was noteworthy because it was originally built outside the city wall and was intended to serve travelers. The church used to have an associated hospital for those travelers. 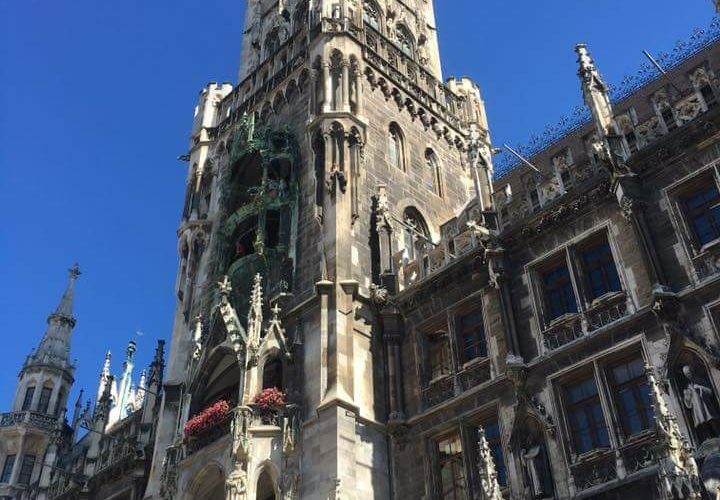 Other noteworthy sites visited were the Juliet statue, an old deli, and Munich’s 1st castle. We also heard about The Pretzel Rider; at least I think that’s his name. After lunch the group split and headed in two different directions. Some of us stayed in Munich, while the rest went up to the Munich Aquarium. While the aquarium turned out to be geared for a younger audience, our kids seemed to enjoy themselves there. The group that stayed in Old Town Munich was able to do some addition sightseeing, grab some souvenirs, and eat ice cream while people-watching. In the early evening an exhausted group returned to the hostel for some dinner and relaxation. We need a good night’s sleep tonight. Tomorrow we are up early and leaving Munich. Neuschwanstein and Linderhoff Castles are on the itinerary. Then it’s on to Augsburg, the final city on our trip.